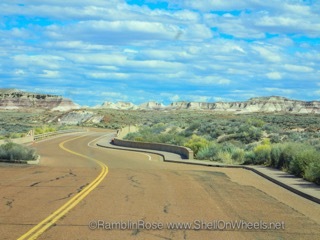 After our more than pleasant two-day stay in Datil Well campground, we really did expect to get up early, well, early for us, break camp and get on the road towards the Petrified Forest National Park by 9 AM, 10 at the latest. The Big Kahuna, however, had other plans, having decided that it was far to cold, particularly at this altitude, to start, much less drive. Ah yes, have I mentioned our rig’s reluctance to start in freezing or near freezing temps? We were actually warned of this when we first picked him up in North Carolina last year. Many modern diesel engines have block heaters, while others might have glow plugs, both these things aid in cold weather starting. The Big Kahuna has neither. With our nearly new high cranking battery we have not had much of an issue: we started without difficulty in temps in the upper 30s. This morning he wouldn’t catch, just billowing forth a cloud of smoke. I suspect the altitude, near 7000 feet, complicated the physics and chemistry at work. Since we were reasonably confident that it was just temperature and altitude, we broke out the generator, made coffee and breakfast, and waited a couple of hours for the day to warm up. Sure enough, by 11 it was 50 degrees out and Kahuna fired right up. We headed up the road towards Pie Town, a little place that is apparently semi-famous for… pie. 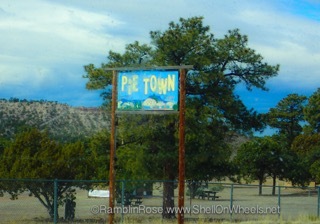 Let me be blunt: unless you are dead set on having pie in a place called Pie-Town, you can give it a pass. The Pie Town Cafe was the only option that morning, their pie, served cold, was nothing to write home about. We experienced an unusual amount of drama while paying in that they require all card payments to have a pin, round the debit card transactions up to the nearest $5 increment, and add a $1.50 charge for any card. None of that was explained before they handed me the $11.50 bill for our $7 pie and coffee. So don’t go, but if you must, keep your expectations low and pay cash. 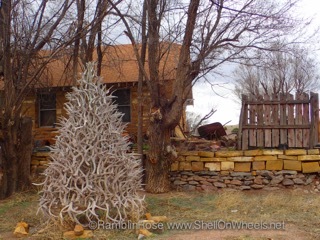 The pie was just OK but this elk horn Christmas tree was fantastic! Onward! 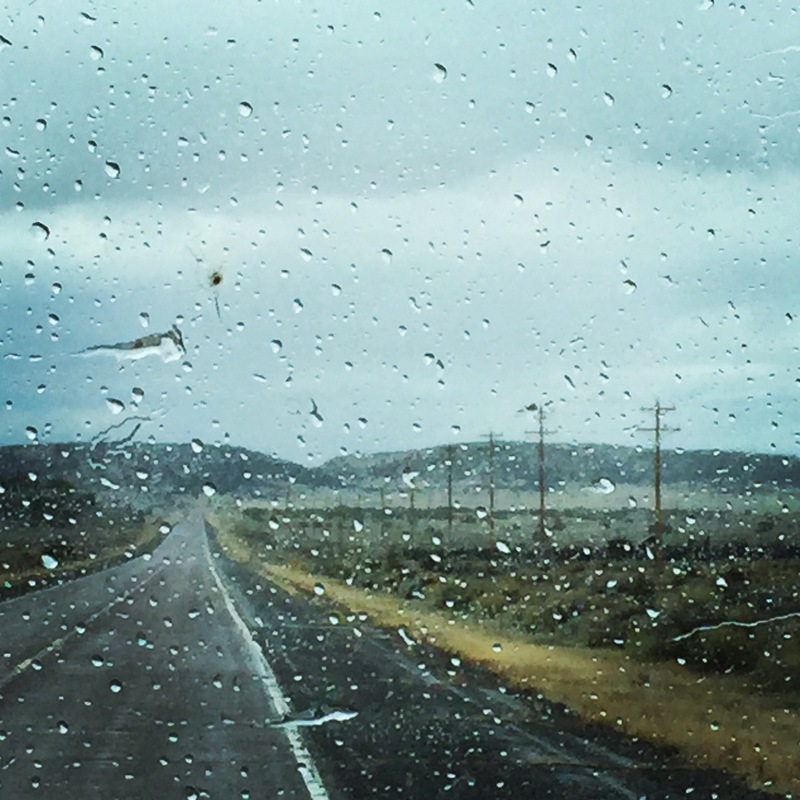 We started a series of major uphill struggles along Highway 60, the earliest parts in light drizzle, passing through 10,000 feet as we crossed the Great Continental Divide. The Big Kahuna did admirably considering the grade and altitude, but my patience was tried as we were frequently down to first gear and topping out at 25 mph. The Continental Divide is the set of mountain ranges that divide North, Central, and South America’s river systems by which flow into the Pacific and which flow into the Atlantic, Hudson Bay or the Gulf of Mexico. Eventually we were on the predominantly down hill leg of the journey into Arizona, and relished the almost dramatic change in scenery once across. We did a minor resupply stop and coasted into the Petrified Forest National Park visitor center shortly after noon. We will save that for the next post. Blue skies, on a downhill and crossing into Arizona: what could be better?